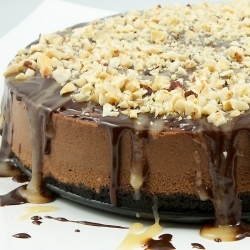 Captivate your guests with this "taste from heaven" - Chocolate Cheesecake Recipe! This is a chocolate cheesecake I actually call a Triple Chocolate and Vanilla Cheesecake. It has an Oreo crust and uses melted chocolate chips in the cake and also to make the glaze. I have seen people really enjoy cheesecake recipes before, but this cheesecake really flies off the dessert tray at the restaurant! When we hear the word cheesecake most of us think of the term as describing a luscious, rich dessert. This cheesecake recipe qualifies as such a dessert. All cheesecakes begin with cheese-usually cream cheese, ricotta cheese, cottage cheese or sometimes Swiss or cheddar cheese. This recipe uses cream cheese as many American cheesecakes do. The filling is made by creaming the cheese and mixing it with eggs and vanilla and then adding melted chocolate chips to half the batter, giving it a layered affect. The mixture is poured into a spring form pan in two steps and carefully baked. A spring form pan is the best choice for baking cheesecakes because you can remove the cake from the pan easily. And the way a cheesecake is baked is the key to its perfection. Oh boy! What a great triple chocolate and vanilla cheesecake recipe! 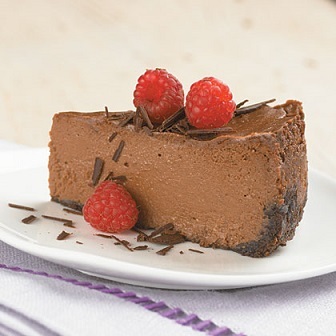 Enjoy your chocolate cheesecake recipe and the company of those you share it with! Did you know? Cheesecake may be considered an American classic, but they have been popular throughout the ages. Cheesecakes of differing types were popular in ancient Greece.